Identification: Females are larger than males. Upperside forewing is brownish orange; hindwing is orange to red-orange with a diffuse dark area at the base. 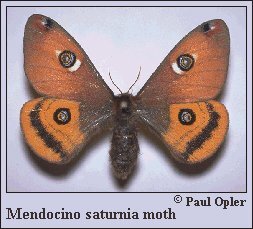 Both wings have small eyespots; spot on tip of male forewing is smaller than the spot on female. The black submarginal band on the hindwing may fade away at its ends. Wing Span: 2 7/16 - 3 1/8 inches (6.2 - 8 cm). Life History: Adults fly in the daytime with a fast and erratic flight. Newly-emerged females fly only after they have mated. Females lay eggs singly or in bunches of 2-6 on the leaves of the host plants. Eggs hatch 1 to 7 weeks later. Loose mesh-like cocoons are attached to stems or branches of the host plants. Flight: One brood from February-June. Caterpillar Hosts: Manzanita (Arctostaphylos) and madrone (Arbutus menziesii), both in the heath family (Ericaceae). Habitat: Chaparral plant communities and the dry edges of redwood forests. Range: Monterey County, California north through the Coast Range and from Tulare County on the western slopes of the California Sierra Nevada, north through the Cascade Mountains and into southern Oregon.